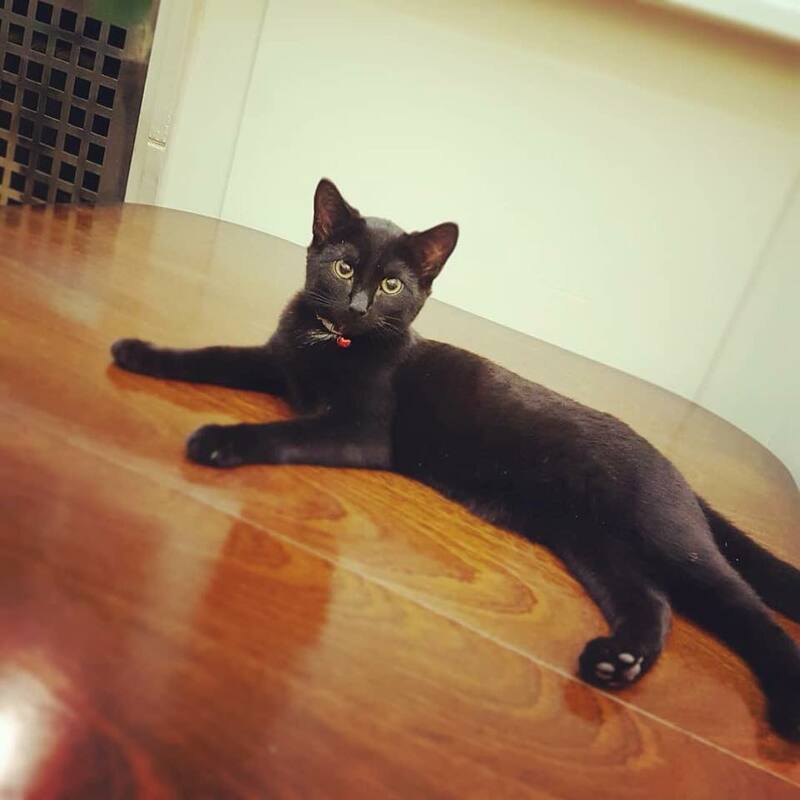 Jack is one of our Ninja Cats and is definitely the liveliest of his little group. He loves to play and chase the other cats around, even if they are quite a bit bigger than him! Although he looks almost identical to his sister Isa, he is more sociable and enjoys sitting on the windowsill with some of the bigger cats. Although still very young, Jack is confident and bold, and can often be found playing chase or trying to steal food from unsuspecting humans. Hubert is the cuddliest of our kittens and likes a lot of attention from humans. Although shy at first, he now likes to playfight with his brothers and has even been seen chasing one of the bigger cats! He is paler in colour than his brothers and has big, sad eyes that make all of our hearts melt. Hubert loves his cat naps and has been known to steal customers’ seats for hours at a time. He’s a real sweetie and one of the cutest kittens we’ve ever seen. 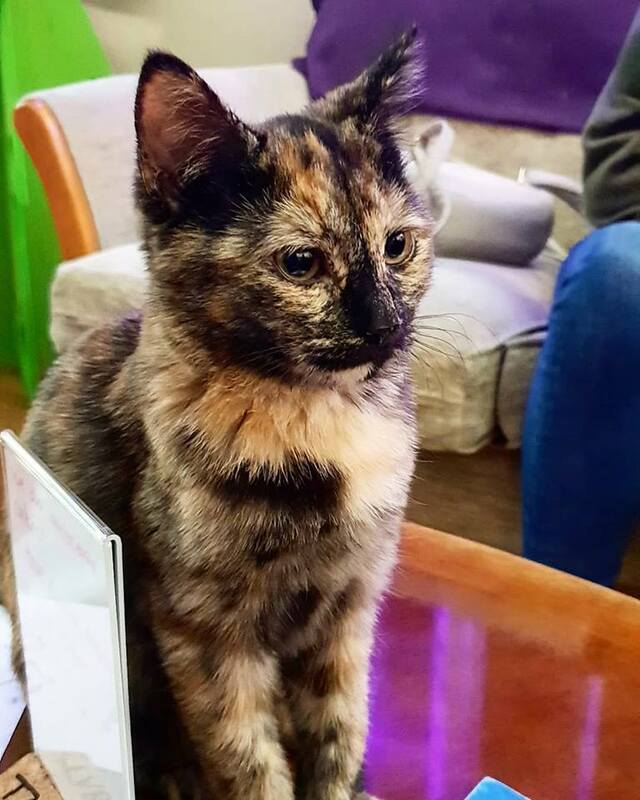 Merida is the tortoiseshell sister of Hamish, Harris and Hubert, and certainly lives up to her namesake in bravery and boldness. She likes to play with people as well as cats, and can often be seen slinking around in search of an unsuspecting kitty to pounce on. When not planning her next attack, she can be found stealing bottle tops from Soozy or snoozing downstairs. Merida gets on well with her brothers and is certainly not exempt from their love of playfighting. Hamish is the leader of our ginger kittens, all of whom are named after the mischievous brothers from the film Brave. Still, brave doesn’t quite do justice to Hamish’s level of boldness, as at six months old he was confident enough to chase around some of the oldest cats. He likes to play with the other cats more than anything in the world, and often ignores the poor humans who are vying for his attention. As the largest and darkest of the gingers, he commands a bit of authority among them and can usually be found wrestling his brother Harris. 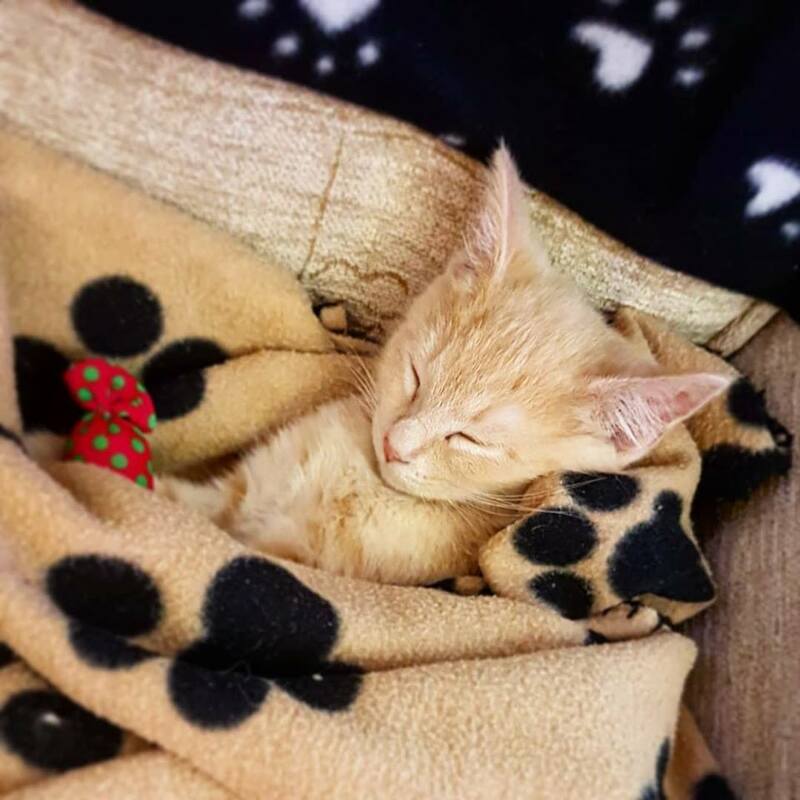 Harris is a feisty ginger kitten who loves to playfight with his three siblings. Although incredibly similar to his brother Hubert in appearance, he is set apart by his willingness to pounce on cats who are more than twice his size. Harris loves to play with both cats and people and enjoys a bit of a cuddle when he gets tired. He has encouraged his brother Hubert to come out of his shell and taught him how to playfight with style, for better or for worse! Harris has also made a special friend in Blossom, who he likes to curl up with on a chair for his afternoon naps. Yoda and Whiskey are lively ginger brothers who enjoy climbing to the highest points they can find. They are both quite relaxed and can usually be found wandering around in search of treats, or sleeping in their favourite spots. Although they look quite similar, they each have their own unique personalities and favourite hiding spots! Tilly is our oldest cat, and behaves like a lovely, grumpy grandma. She is a beautiful Ragdoll and was rescued via the charity Catflap in 2017, along with her brothers Gilbert and Harry. She has blue eyes as deep as the ocean and insists on going at her own (very slow) pace. She can be a little temperamental when another cat steals her seat, but she adores people. She loves to have her head scratched and enjoys being brushed. If you stand up, she will often steal your chair. She's cheeky and a bit grumpy at times, and we love her all the more for it! Soozy is a cheeky tortoiseshell with a great love of chasing bottle tops. She is the embodiment of the expression "tortitude". When she was a new born, she was easily the biggest of the litter, and stayed so until about 4 months old, when the other 3 all began to grow much faster than her. She is a light footed little lady, and for some reason she loves shoes! She is always sniffing or just generally playing with someone's shoe, even if the shoe is still being worn! She really loves the camera, and tries to get in on any filming or photography that's happening. Islay is scatty little thing! She is from the same litter as Soozy, Islay and Arran, but she is more similar in size to Bubbles and Blossom. She is very much the cat version of Maria from The Sound of Music - how do you catch a cloud and pin it down? We tried, and she is almost impossible to film or photograph without running all over the place chasing her! She is a tuxedo, and the most playful of the bunch. She likes a cuddle when tired, but mostly she is running and jumping until she flops down somewhere, exhausted. Skye is last to wake up, and first to go to sleep! She is the laziest of the tuxedos and adores a good cat nap. She isn't really one for cuddles with humans, but does cuddle up with the bigger cats like Harry and Gilbert, most probably to get a cosy sleeping spot! She is quite playful when everyone else is, but she tends to get quite lazy and will lie down way before everyone else. She is the most distinguishable among her litter as she is the only one with a completely black nose. Harry is a stunning Ragdoll boy who was rescued alongside Tilly and Gilbert. He is 10 years old and a very cuddly boy. Anyone who has been following our progress on social media will know that Tracey has a very soft spot for him! He was in a very bad way when he was rescued, but he still managed to steal her heart, and hasn't given it back. He's extremely playful, loves being groomed, and enjoys cuddles on the sofa. He's the second largest cat we have after Gilbert, and has a surprisingly high-pitched voice! Harry has a favourite spot in the café where he can always be found sleeping or begging for treats, and absolutely loves to be cuddled. Gilbert is a big and beautiful Ragdoll and was rescued with Harry and Tilly. 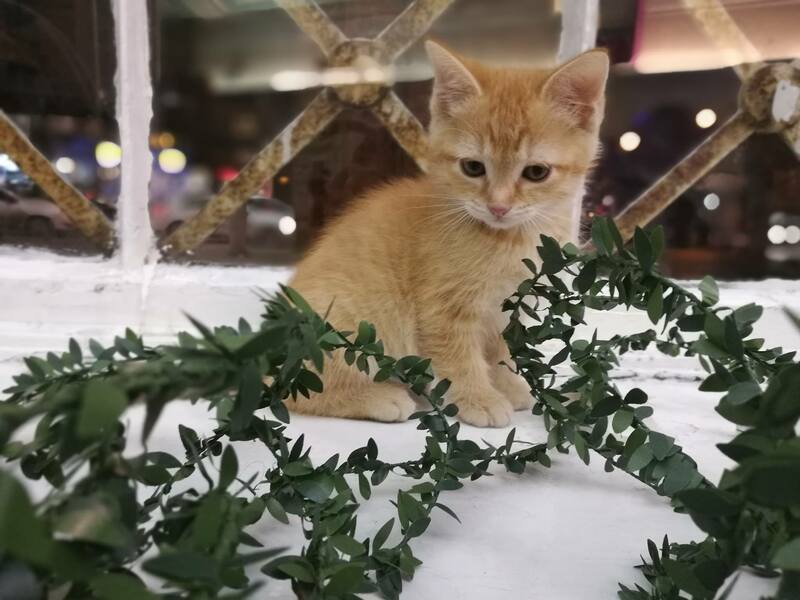 Gilbert has a brother Gabriel, who was unable to be rehomed with us at Purrple Cat Cafe due to having a heart condition that means he needs a quieter home. Gabriel has a very happy home now with a quiet family, while Gilbert has come to live with us alongside Tilly and Harry. Although he isn't as keen on grooming as his pals, he is a contented soul who enjoys the company of other cats and humans. He can be very shy at times, sometimes sitting just at the top of the stairs to he can observe everything that goes on. Gilbert has become much friendlier since he first arrived at the café, but can still be very shy around people and spends a lot of time sleeping on the windowsill. Buttercup is the smallest of the Powerpuff Cats, and also goes by the name of Tash. She is a bit shyer than the rest of her litter, but she is still pretty feisty. She is more white than black, and has a little black moustache, and quite a confused look on her face, due to her markings. Although not much of a cuddler, she loves to play with both humans and cats. 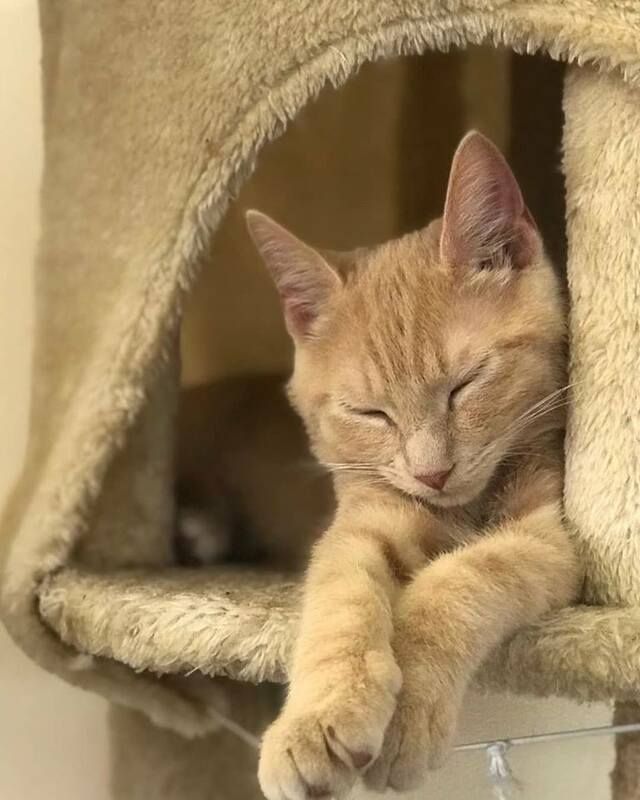 When not making mischief, Buttercup can be found curled up in a perfect ball on one of the cat condos, enjoying a good cat nap. Bubbles is a lovely, cuddly boy who enjoys napping in the middle of the floor and being carried around in Tracey’s jumper. He has huge eyes that always make him look surprised or sad, and which are completely irresistible. He is part of the Powerpuff Cats group, who were born in March 2017 and are still quite small. Bubbles, along with his sister Blossom, are real growlers. Try taking a toy, food or anything from them, and you'll think someone has just revved a Harley Davidson! Bubbles becomes exceptionally cuddly when he is tired, and sometimes likes to be cuddled like a baby. Blossom is a feisty and playful Powerpuff Cat, and she can be very difficult to distinguish from her brother Bubbles. They are the same size and both have huge eyes and almost identical markings. Although Blossom likes to play a lot, when she is tired she is a very cuddly girl, and she likes to sniff and dig at people's hair! Sometimes she will curl up on your shoulder and gradually sneak her front paws into your hair. Blossom likes people almost as much as she likes food, and she can often be seen sneaking around, trying to steal people’s snacks from right under their noses! Arran is the only boy in his litter, and is one of our most playful tuxedos. His sisters Soozy, Islay and Skye all fall in line when he’s around, as he likes to assert his authority and act like the boss. Arran is very clearly becoming the mini version of our Alpha cat Billy, tending to the kittens and grooming them on occasion. It's very amusing to watch a seven-month-old kitten play mummy to a litter of two-month-old kittens! Being so young, he still enjoys a lot of rough play with the little ones, which they enjoy as much as he does. Arran has had some health issues due to his gigantic appetite, which has resulted in him being fed only wet food and special treats that won’t make him ill. For this reason, we ask customers to make sure they don’t feed Arran kibble during their visit. Billy is the Biggest of our tuxedo cats and is also the boss of the bunch. He was part of a group of five cats rescued through Catflap. Tuxedo cats tend to have a very playful, almost puppy-like personality, and they really do love spending time with humans, perhaps more than they do their own siblings! They are cuddly when they've eaten, or when they're tired, but otherwise, they are full of life and very playful. Billy, in particular, is our Alpha cat, and a bit of a mama-bear. He has taken the parental role whenever we have introduced any new groups of kittens, but he can be very greedy when it comes to snacks! Arran is his right paw man, and second in command. Billy and Bear are both beautiful long-haired cats who get along incredibly well. Although they have very different personalities – Billy being our Alpha while Bear can be very shy – they love to curl up for a cat nap together when they get sleepy. Bear is definitely the gentleman among our boys. He is a long haired, light ginger coloured domestic cat and is around 3 years old. He lets almost every other cat and kitten get to a bowl before him at breakfast and is a very gentle natured boy. He was rescued alongside four other boys, including Billy, our Alpha cat. Bear was definitely the timidest cat when he first arrived at the café, but in the last few months his confidence has really grown and now he is quite friendly and likes a good cuddle every now and then. It’s a good idea to let Bear to make the first move when approaching him, which can be difficult because he is so soft and beautiful. If you’re lucky, he just might be up for a bit of a play or a stroke. Yoda was one of the most challenging cats when he was first rescued, choosing a spot on the windowsill and pretty much refusing to move. After many, many hours of sitting beside him, coaxing him down and giving him lots of treats when he took his tiny brave steps towards us, he just wandered into the front room and sat on a chair next to all of the humans and cats who were there! We were all completely dumbfounded and incredibly proud of him. He is still a little awkward, but he is not timid at all now. He has found comfort in his new colony, and although he hates being lifted, he really loves being stroked and will chase anyone who has even the slightest scent of treats on them! He will usually be found on a podium, watching people and cats, or trying to tap your head if you walk past without stroking him first. Whiskey is a short-haired ginger and white domestic cat of approximately two-years-old. When he was first moved in with us, he was a very timid boy, as you can see from a video on our YouTube channel. Called ‘The magical disappearing Dreamies’, it shows his little paw appearing from under the bed to get a treat, as he wouldn't come out if there was more than one human around. Now that he is settled, he is very friendly and enjoys playing with most of the toys, but especially the red dot! He is loud at feeding times, and will complain if you leave him mid-stroke. He is best pals with Soozy and can often be found lazing around beside her on a bed somewhere. He has also taken a liking to the Ragdolls and can often be seen following them around, trying – and sadly failing – to win their affections.